A daily account of the sh*t my stay at home mom friends never told me and what I'm learning the hard way! Halloween has come to a close and mommy is completely exhausted. What began with a miniature pumpkin patch concluded with The Great Pumpkin. The Ego . . . you know, the child who keeps writing “give me 20 bucs” notes to the tooth fairy . 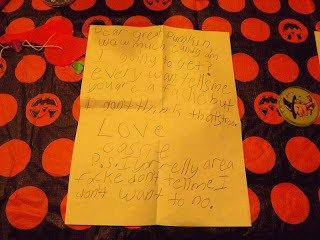 . . has now decided that she is Linus and needed to write to the Great Pumpkin. Right down to the Nuh Nuh she now carries around (this is a name that she learned from BFF Molly’s son - it is how he refers to his blankie)! This kid is going to kill me with all her notes to fictional characters. It means that I have to keep showing up and I have to take ½ an hour to write my left handed notes. 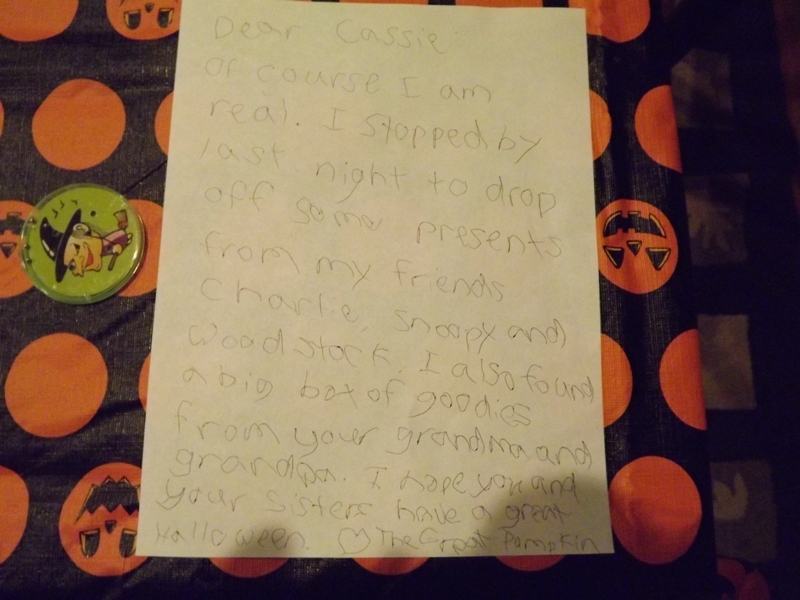 And, this one I could not screw up – there was no way I was going to be able to convince her that November 3rd was still Halloween and the Great Pumpkin was on a spy mission. 1) When you decide to allow your 9 year-old to wear red lipstick as part of her costume, be prepared that she will add mascara and get her sisters in on the act; instead of 3 fairies you will end up with 3 goth whores with wings and capes. I’m not exactly sure what I was thinking when I let my children add red lipstick to their costumes. I’m just hoping that daddy didn’t notice until just now! 2) If you are going to perpetuate the fictional characters that your parents lied to you about, be sure to brush up on your “wrong-handed” handwriting because you may have a child who insists on making you prove that you are real. Waw much candy am I going to get? and grandpa. 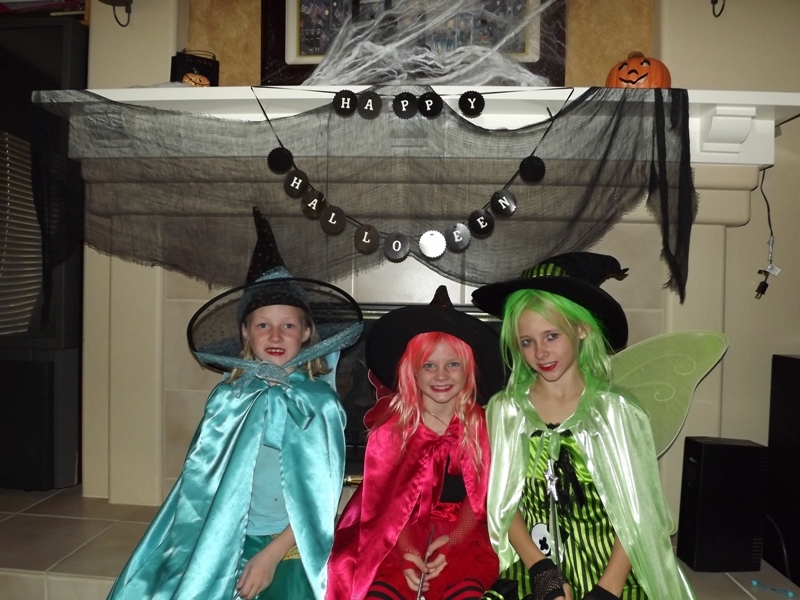 I hope you and your sisters have a great Halloween. 3) When you have procrastinated on taking your daughter’s five year-old pictures (I’m only 2 months late on that), you may want to think twice about spraying her hair pink. Otherwise, it will be several more months before you will actually be able to take those photos. Nana washed the Id’s hair at least 3 times and she still has a red scalp and pink hair. Maybe a second “brush up” coat for Halloween night was a mistake! 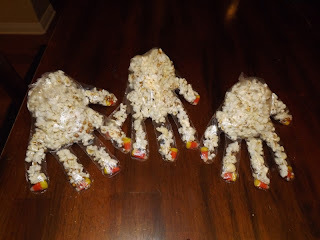 4) When you leave the Nana at home to pass out the candy on Halloween night, make sure you have your kids stop by periodically during trick or treating so that they can drop off their candy and she can employ a mommy secret of giving away your own children’s candy to the kids coming to the door. Admit it mommies, you’ve done it. 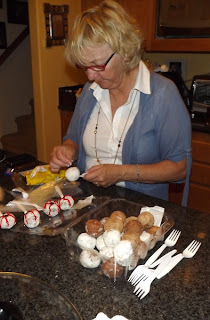 We had many more kids than we anticipated and we left Nana to scrounge for things in the pantry to give out in order to save our house from getting “tricked”! 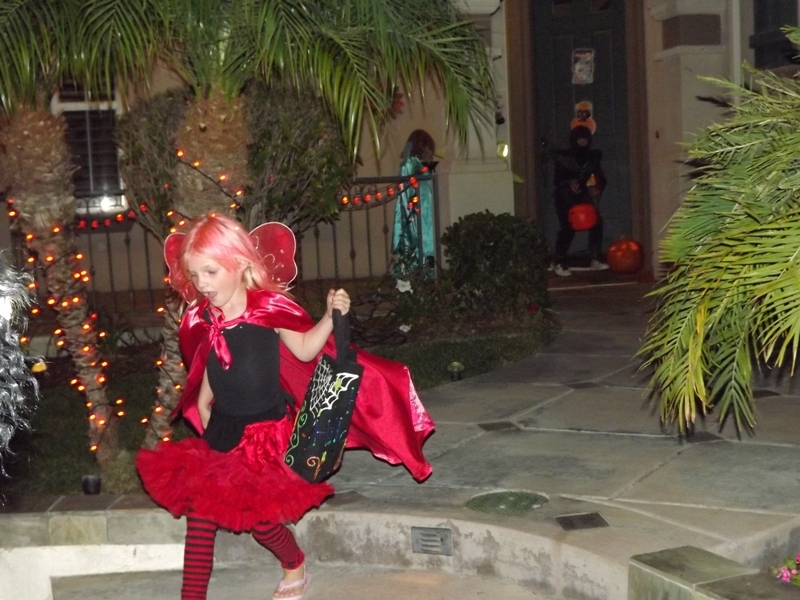 I'm not exactly sure why we all go through the charade of trick or treat. We all went to the same Costco to get our bags of candy. We might as well just buy those big bags, give one to each of our kids, and call it good! 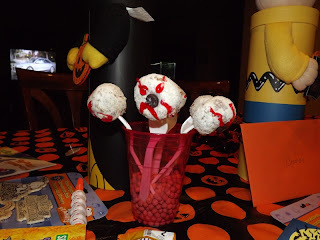 Here are some fun Halloween things that we did that were easy (next year I'll post them sooner so you can steal them). Big shout out to Nana who made the Eyeballs and Mummy dogs! 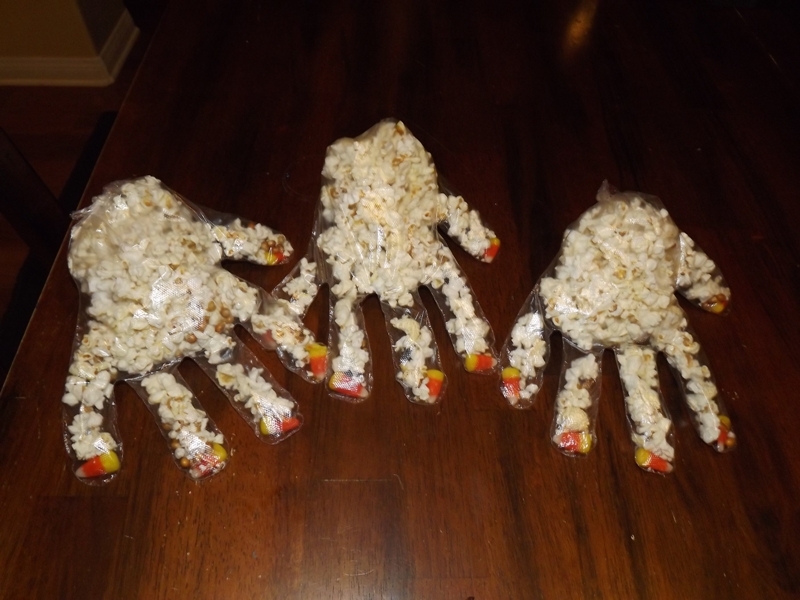 1) Popcorn/candy corn hands in the lunches. We found out later that this was the only thing they ate that day. At least they got some good fiber! 3) Mummy dogs - take pre-made bread dough (I used the kind that comes in a roll out sheet), cut it in strips, wrap it around the hot dogs, cook for 15 minutes and add some mustard eyeballs. 3) A celebration on the table. 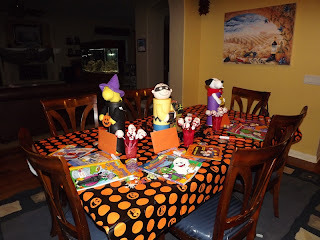 Throw on a table cloth, include a few goodies from Michaels (we got lucky that Michaels knew of our Great Pumpkin theme) and, if Grandma and Grandpa have sent a Halloween goodie box, put that out too. The kids will wake up to a party on the table and will think the Great Pumpkin stopped by. Top 7 stay at home motherhood lessons I learned the hard way. 1) Girls Night Out is code for "essential therapy without which I would actually eat my young." 2) "Stay at home" mom is code for "at the gym, grocery store, dance studio, soccer field, insert child's activity location here, child's classroom, and any of the other 15 places I'm needed other than home". 3) Hurry up and wait is a way of life. 4) Sitting down is not an option. The time you actually sit down when you're "at home" is less than 45 minutes, and all of those minutes are spent in the car on your way to the activities you decided would make your kids "well rounded". No wonder my nannies were so exhausted. 5) Those closets you thought you'd clean out are still as cluttered as ever, and might be more so because you are home now so you can stuff a bunch more crap in them. 6) The exhaustion you feel is because you have just been verbally poked for hours straight by miniature versions of yourself. 7) If the CIA wants an effective form of torture - they should put terrorists in a minivan at 4pm with three children who have not had a snack or a nap. Two words . . . De-Tox! Holy Humidity . . . Traveling psychoanalytic theories . . .
Radio Silence . . . Your own personal crash test dummy!